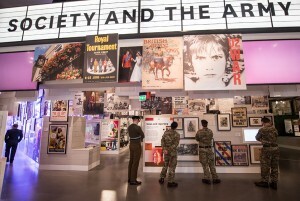 A national museum dedicated to the British Army has existed in some form since 1960. The current site of the museum, in London’s resplendent Royal Borough of Kensington and Chelsea, has been standing since the early 1970s. 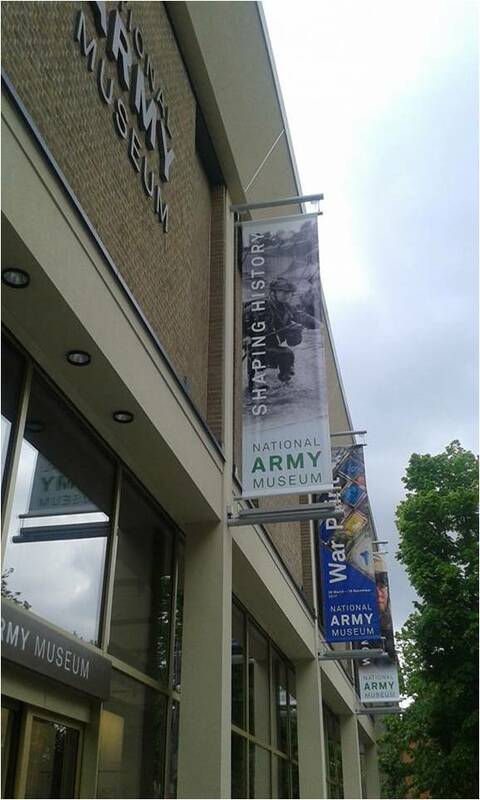 After closing in May 2014 for a revamp, on 30 March 2017 the National Army Museum opened its doors again to the visiting public. A visitor, like myself, who may not have visited the museum before its renovation might feel both hampered and liberated by a lack of comparison with its pre-2014 incarnation: hampered by possessing less points of comparison in light of its £23.75m renovation, and benefited in that visitors can view the newly opened site unprejudiced by past experiences. Indeed, this seems to be the intention of the museum’s designers and directors, with a potted history of the museum’s development conspicuously missing from its website. But from what can be gleaned from a cursory online search, it is apparent that the revamp is a great improvement. This review will focus on the permanent exhibitions in particular, taking into account their particular renderings of historical narrative in relation to a national history of the British Army. 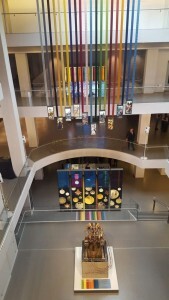 Upon entering the Brutalist building which houses the museum collections – a stunning contrast with the palatial Royal Hospital Chelsea nearby – the visitor is not steered in the direction of any gallery or exhibition in particular. Organised around broad themes, the narrative flow of the museum can be, to some extent, decided by the visitor. 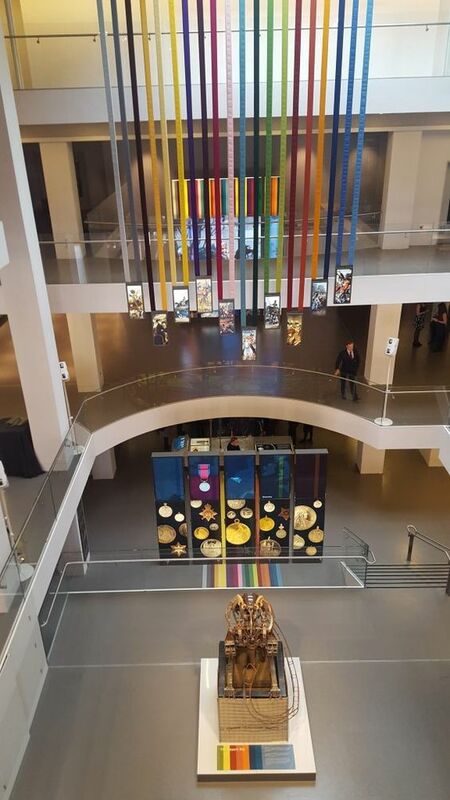 I began with the ‘Soldier’ permanent exhibition (Ground Floor), which posed the question at the entrance and exit, ‘Could you be a soldier?’, offering visitors the choice of passing a sensor that registered their decision yes or no. I kept this question in mind as I viewed the exhibit, which takes the visitor through the process of becoming a soldier, from the recruitment office, to the training grounds and onto the field of battle. What struck me immediately was an overarching sense of continuity over time and commonality across historic military contexts stressed by interpretation panels. Eschewing a chronological strategy, the army recruit’s journey is presented as, if not unchanged, broadly applicable to a wide range of historical contexts and scenes. Oral and written testimonies by servicemen and women span four centuries, purporting to take in the entire lifespan of the modern British Army since the establishment of the first standing military force in the 1660s by Charles II. Material culture and the personal views of rank-and-file soldiers are the primary means of representation in this exhibition, with a wide array of objects illustrating narratives of everyday experience for soldiers. One display cabinet, exploring elements of clothing, personal grooming and consumer ephemera, presents examples from the Peninsular War (1808-14), the First and Second World Wars, the Napoleonic Wars of the early-nineteenth century, the First Gulf War (1990-91) and the recent war in Afghanistan (2001-14). This included none other than the Duke of Wellington’s shaving mirror, dated from around 1805, a packet of novelty cigarettes from 1945 and a controversial ‘Taliban Hunting Club’ patch from 2011. This display serves to illustrate the variety and complexity of military life for those intimately involved. Though the objects are often related to elements of government and military policy, it is the voices ‘from below’ that are set centre stage. Indeed, certain characters, such as Army nurse and Afghanistan veteran Patsy Beesley, are repeated throughout the gallery – a practice continued elsewhere in the museum – in order to allow visitors to follow the journey of ordinary soldiers from ‘civvy street’ to the complex and often conflicted life of military personnel: a mix of stringent discipline, collective and individual pride, and the potential for adventure unimaginable in any other field. Other displays focus on positive and negative aspects of daily life in the barrack room, from changes in regulation uniform, to leisure activities, food quality and relations between ranks. There is even an interactive parade ground, where visitors can learn drill from a CGI sergeant. A highlight, for me, was the inclusion of Army recruitment posters from a variety of periods, in order to show the shifting priorities of the organisation. Alongside more famous First World War posters sat examples that encouraged recruitment of soldiers from black and minority ethnic (BAME) backgrounds, including one from 1998 that adapts the ubiquitous depiction of Lord Kitchener (“Your Country Needs You”). Following the ‘Soldier’ gallery, I moved on to ‘Army’ (First Floor), which sought to provide a chronological timeline of the Army’s development since the 1660s. It begins with the question, emblazoned in lights at the entrance, ‘Why do we have an army?’. Beginning the exhibition in this way helps problematize the presence of the armed forces in society, eliding, at least on a superficial level, a slippage into a ‘common-sense’ truism as to its origins. The narrative offered charts the political debates, decisions and battles that led to the formation of a British standing army, illustrated by colourful, intersecting lines on the gallery walls maintaining a thread throughout, alongside portraits of central actors. There is also a pictorial illustration of army ranks, with attention paid to historical shifts in their composition, as well as pie charts showing the relative size of the Army at particular flashpoints in its history – from the fledgling professional force of the English Civil War, to the enormous volunteer and conscript armies of the twentieth-century ‘total’ wars. From a broad overview, the displays move on to focus on the regimental traditions of the Army. This is explored through both electronic and analogue activities; namely, a touchscreen panel with explanations of regimental insignia, with videos and tailored personal testimony attached. A more traditional ‘lift the flap’ method is used to reveal the many amusing and, often, un-PC nicknames of regiments, from Royal Army Dental Corps’ ‘Tooth Fairies’, to the Welch Regiment’s ‘Rarely Welsh’. The exhibition ends with a display of objects and interactive interpretation boards, designed very much like a smart phone. I was able to explore the objects displayed in a way tailored to my own interests – a variety of material, from an eighteenth-century carved depiction of an Indian sepoy, to posters from the 1990s promoting the recruitment of women. The ‘Battle’ gallery (First Floor) carries on in a similar vein, though a thematic strategy cuts across the broadly chronological. The themes of ‘Fear’, ‘Courage’, ‘Human Cost’ and ‘Medical Care’ organise displays of weapons, uniforms, medical equipment and personal ephemera, beginning with battles in the English Civil War, through to the Napoleonic Wars, the First and Second World Wars, the Troubles, Iraq and Afghanistan. These themes again seek to draw together common threads of military experience, addressing popular coping mechanisms, contemporary artistic and media depictions of soldiers and battle, and many original and reproduction medical instruments. Though seeking to establish such commonality across historical contexts is potentially problematic, in this case the themes are an effective way of corralling the subject matter, in what otherwise may have presented straightforward battle narratives within neat timeframes. Another potential danger of this approach is the reinforcement of a now commonly contested dichotomy – at least in academia – between the battle and home fronts. This tendency rears its head a number of times throughout the museum, including within the ‘Soldier’ gallery, where a panel states: ‘When they leave civilian life behind, people are transformed by the army’s rules and culture’. While this is certainly not inaccurate, it is not necessarily accurate for all modern conflicts. The First World War, as a number of authors have explored, was the site for manifold continuities with pre-war and wartime civilian life, often sustained through personal correspondence between combatants and their loved ones, as well as through voluntary actions like tobacco and comforts funds. The assumption of a common experience also overlooks the differences between particular forces within the Army. For example, while there are frequent allusions to the Territorial Army (historically a voluntary, home defence force), its difference from the regular army, including cultural nuances, is left largely unexplored. At the risk of over-analysing this particular aspect, I would suggest that it is almost seen as incumbent upon a national museum to attempt to present a cogent narrative of an aspect of national historical development, however many conflicting and anomalous points muddy the waters. As with all museums, as much as with reading, it is important to seek multiple sources, so perhaps a coterminous trip to the Imperial War Museum would help in further contextualising the NAM. All historical accounts are individual and selective. Our understanding of the army is shaped by military histories written by soldiers and historians. But even they use persuasive argument and storytelling in order to make their subjects more appealing or palatable and increase sales. This is refreshingly self-aware for a national museum. While foregrounding the ephemera and representations to follow – they are, after all, mediated constructions and interpretations of authors and groups of producers – this also speaks to what the revamped NAM is achieving through its multifaceted approach to British army history. It is admitting that, not only is the Army an organisation with multiple levels, bureaucratic and ranking, it has its own unique internal culture, is a popular cultural phenomenon, a political entity and a pawn of governments. In short, there is no single history of the British Army, as the variation of players in the story and the relative discursive power of certain players can define the limits of the story and how it can be told. While engaging and often very entertaining, the strategy of presenting an overarching and temporally-transcendent picture of the Army as an organisation becomes problematic at various points throughout the museum. While it is vital to foreground the voices of ordinary soldiers, when men and women’s experiences – from a panoply of conflicts and imperial adventures spanning four centuries – are presented in tandem, without regard for specific historical contexts, the effect can be ahistorical and potentially overlook systemic inequalities and changes to operating procedures over time. Furthermore, stressing continuity and commonality across diachronic and synchronic contexts may eschew subtle, and less subtle, differences between conflicts, their prosecution, technology and modes of material and social mobilisation. Saying all of this, a national museum retains a certain remit to present, however contestable, a more-or-less ‘complete’ picture of the developing role of the army from its inception. At least, this is what the museum’s aim appears to be. 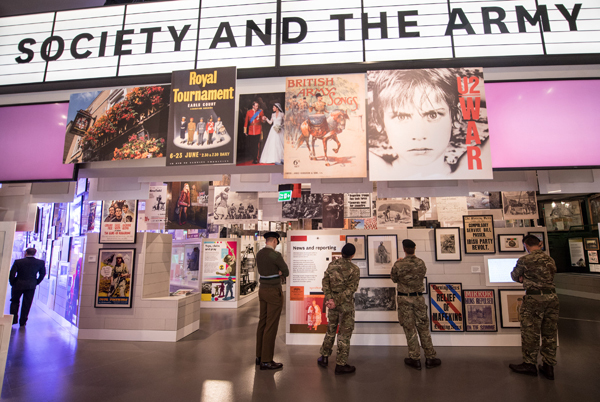 This may be a near-impossible task, but it does not mean the museum fails to present a rich and diverse picture of both the Army’s role in British society – as well as its former colonial possessions – and its day-to-day functioning for personnel. For a museum with a national status, it is remarkable how the opinions and actions of ‘great men’ are placed in the background. While they still provide a scaffolding for historical events, the way the historical British Army has functioned as a corporate body, with its unique cultural and social aspects, is not abandoned in favour of deterministic actions by politicians and military leaders. A similar point can be made about the display of weaponry and vehicles. Rather than standing in as exemplars of a causal relationship between technology and warfare, they are illustrative. As opposed to the mechanised winners of wars, they are tools used by actual people to prosecute conflicts. 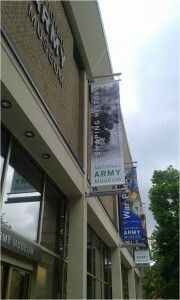 The museum is also strong in its ‘writing in’ to the public narrative of the Army the presence and considerable contribution of colonial soldiers – who fought for the interests of Empire during the nineteenth and twentieth centuries – and non-white servicemen and women in the late-twentieth century, through to the present day. This reflects efforts among academic and public historians to reassert the central role of the citizens of Empire in military conflicts, particularly the First World War; though much more work is required, particularly with regards the contribution of colonial subjects to the British home front in both world wars. Taken as a whole, the NAM presents a multifaceted and open-ended view of the historical development, and continuing significance, of the British Army, that does not shy away from a ‘warts and all’ honesty about the constructed nature of historical narrative and the conflicts between different players in the game of definitions and representations. It also avoids disproportionately focusing on more ‘popular’ wars and, to a somewhat limited extent, attempts to grapple with Britain’s imperial past. It will be fascinating to see future temporary exhibitions attempt to address some of the thornier questions that permanent galleries cannot necessarily cover in detail. Perhaps this would be a way of ensuring and furthering a commitment to the nuanced and multi-level approach taken up to this point. Michael Reeve is an AHRC Heritage Consortium doctoral candidate at the University of Hull, with secondary supervision from Leeds Beckett University. His thesis explores the civilian experience of naval and aerial bombardment on the north-east coast of England, with a particular emphasis on the multi-level efforts of central government, local authorities and urban maritime communities in presaging, planning for, and responding to, the threat of war ‘brought home’ to British shores. He has recently published on the history of smoking among soldiers during the First World War and retains an ongoing research interest in twentieth-century urban and consumer history. P. Grant, Philanthropy and Voluntary Action in the First World War: Mobilizing Charity (London, 2014); J. Meyer, Men of War: Masculinity and the First World War in Britain (London, 2009). ‘Telling the Truth’ panel, ‘Society’ exhibition. K. Jenkins, Re-thinking History (London, 2003), 39. In the realm of public history, historian and broadcaster David Olusoga has done much to promote this emerging area of research, through both publications and television programmes. See, for example, Black and British: A Forgotten History (London, 2016). This entry was posted in Uncategorised on 22nd May 2017 by Grainne Goodwin.